Almost three miles (5km) long, Nevsky Prospekt is one of the best-known streets in Russia and is the main thoroughfare of St Petersburg. The Nevsky Prospekt starts at the Admiralty building whose gilded spire is a famous city landmark, passes the Moscow Railway Station and the Alexandr Nevsky Monastery, where some of the country's most celebrated artists are buried. Nevsky Prospekt has been the hub of St Petersburg for centuries and cuts through the most important segment of the city. 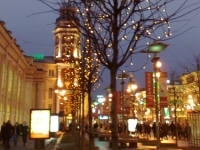 Intersected by rivers and canals, the most beautiful part of the avenue surrounds the Griboyedov Canal. Here the impressive colonnade of the grand Kazan Cathedral catches the eye, curving around a small grassy square opposite the view of the multi-coloured onion domes of the Church of Our Saviour on the Spilled Blood (officially called the Resurrection of Christ Church) is breathtaking. Modelled on St Basil's Cathedral in Moscow and adorned with exquisite mosaic panels, the church is one of St Petersburg's most striking landmarks, built on the site of the assassination of Emperor Alexander II in 1881. As well as many churches the street boasts St Petersburg's finest shops and restaurants, old manors and impressive buildings, and a beautiful mixture of architectural styles from the different periods of its history. If you walk down only one road in St Petersburg make it the Nevsky Prospekt.